Returning by popular demand, Phillip Schofield is to exclusively host the return of hit UK concert tour, The Knights of Music. 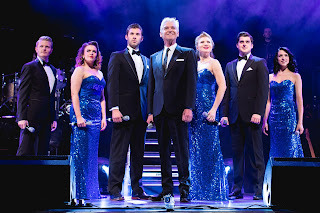 The tour will visit stages in Nottingham, Edinburgh, Newcastle and London from 27-30th April. The show celebrates the legendary Knights and Dames of the entertainment industry who have transformed the face of music, film and theatre throughout the ages. The Knights include: - Sir Elton John, Lord Andrew Lloyd-Webber, Sir Cliff Richard, Dame Shirley Bassey, Sir Paul McCartney and The Beatles, Sir Cameron Mackintosh, Sir Tim Rice, Sir Mick Jagger, Sir Bob Geldof, Bono, and the newly knighted Sir Rod Stewart. Last year’s tour saw Phillip dust off his dream coat after a 17 year hiatus and showcase his spectacular singing range, performing some of the greatest hits from Joseph and his Amazing Technicolour Dream coat. Joining Phillip on stage and helping to bring the best of British to life will be a vibrant cast of West end performers and a live band. Musical numbers will include: ‘I’m still standing’, ‘Rocket Man’ (Elton John) ‘Twist and Shout’, ‘Hey Jude’ (The Beatles)’ I Dreamed a Dream’ (Les Miserables) ‘Do you want to dance’ (Cliff Richard) ‘It’s not unusual’ (Tom Jones) ‘Close Every Door’ (Joseph) ‘Satisfaction’ (Mick Jagger) ‘Maggie May’ (Rod Stewart) to name just a few.